Mixed connective tissue disease (MCTD) is a systemic disease which consists of clinical symptoms observed in the following three disorders: systemic lupus erythematosus, polymyositis, and systemic sclerosis (also known as systemic scleroderma) . 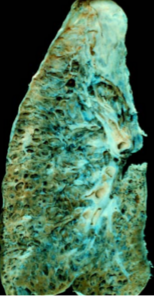 MCTD is considered an "overlapping disease" as it contains features of these three disorders. The features can be categorized broadly as arthritic changes, cardiopulmonary dysfunctions, skin changes, muscle weakness, kidney disease, and dysfunctions of the esophagus. The symptoms associated with the three underlying disorders do not generally present simultaneously. It usually takes several years before the symptoms of each individual disorder present, which ultimately complicates the diagnosis of MCTD. Typically, the first symptom to present is swelling of the fingers, or the presentation of “sausage fingers”. As the disease progresses, it can often affect multiple organs such as the lungs, heart, and/or kidneys. 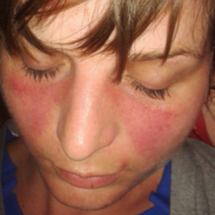 There is no cure for MCTD, however side effects can be managed through the use of medications. The exact cause of MCTD is unknown, but it has been classified as an autoimmune disorder. 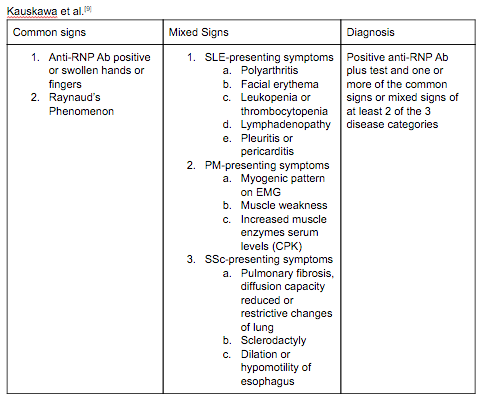 Individuals with this disease have high levels of antinuclear antibodies (ANAs) and antibodies to U1 snRNP. A genetic link can be seen in MCTD in that some individuals diagnosed with MCTD report having a family member who also has a connective tissue disease. Also, exposures to certain chemicals or viruses such as silica or polyvinyl chloride have been found as potential causes of MCTD. 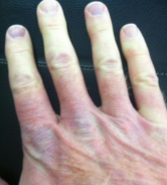 The initial sign of MCTD may be shown as a presentation of puffy and swollen hands, Raynaud’s phenomenon, and polyarthritis. 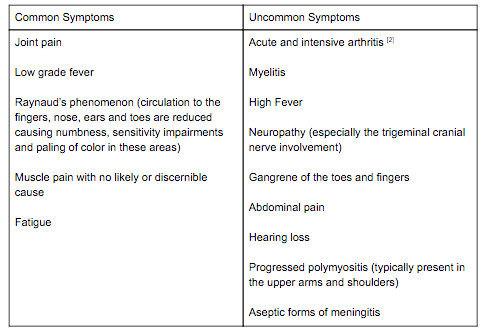 The chart below lists some of the symptoms common versus uncommon symptoms in early stages of MCTD. Currently, there are three different criteria classification systems that are associated with predicting the probability that an individual may have MCTD. These three classification systems are set forth by Modified Sharp et al (1987), Alarcon Segovia et al (1987), and Kauskawa et al (1987). 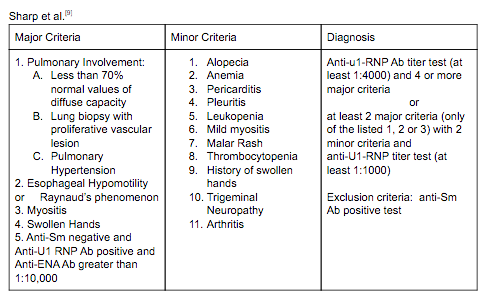 Listed below are the criteria sets that are presently used in the diagnosing MCTD. Since there has been limited research regarding physical therapy treatment in patients with MCTD, interventions should be tailored to address the impairments of each individual. Although each person presents differently, there are some common areas that need to be addressed in nearly all cases. Individuals with MCTD often present with decreased aerobic capacity and weakness of the proximal musculature. Physical therapists should treat according to the common deficits seen in the disease, as well as personal impairments that arise with each case.